If you live in any major city, you’ve seen them. They’re fast, fun and beautiful. Fixed gear bikes are a ‘back to the basics’ concept that has caught on in a major way. The idea is really simple: rather than having gears, derailleurs and a freewheel, these bikes have only one speed. In addition, the cog is fixed to the rear wheel. That means it turns at the same speed as the wheel… and no coasting. The result is a compelling, visceral feeling of control. It’s hard to describe until you give it a whirl. One reason why fixed gears are so popular is the accessible price point. You can either pick up a whole bike for a song, or you can find a sturdy vintage frame and do your own conversion. I’ve done a few of these vintage conversions myself, and it’s a blast. There’s no better way to know your ride inside and out. If you’re going to convert, you’ll need some good wheels to work with. They’re the one modern component you can’t go without. This piece reviews a handful of the best, most affordable fixed gear wheelsets around. I hope it helps! 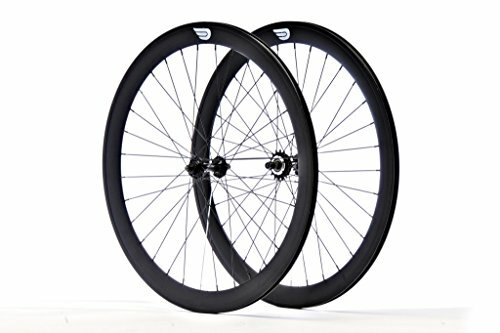 FYI: Track Wheelsets vs. Fixed, What’s the Difference? 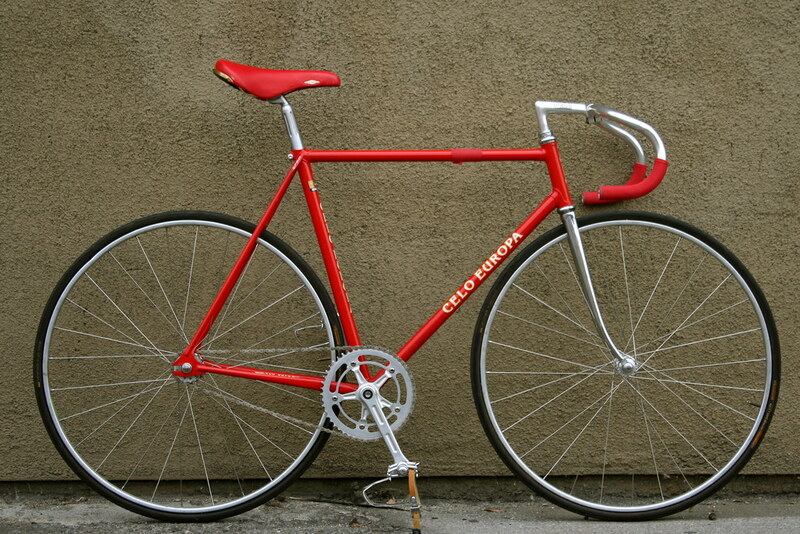 You’ll see wheels of this type described as both track and fixed gear sets. That can lead to some confusion. Ultimately, they are almost identical. The main difference? 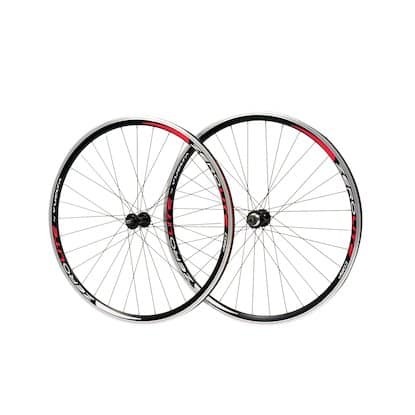 Track wheelsets are intended for a velodrome (race) setting, and aren’t really designed for pavement riding. Modern fixie wheels, on the other hand, are designed for street use. They tend to come with a flip-flop hub. That means they have a fixed cog on one side, and a freewheel cog on the other. That way, you can flip the whole wheel and switch between the two styles. Flip-flop hubs are very handy, but it’s something you won’t find in track. A freewheel cog is useless in a track race setting; it’s just extra weight. All this being said, you’ll still see the two terms thrown about interchangeably. At our price range it’s pretty much moot anyway. If you’re looking for something clean, simple and effective, and you want something cheap to buy, consider Pure Fix’s colourful collection of deep dish rims. They have a number of different track style wheelsets in various configurations, from classic stealth to super deep-V. I like this particular set because it’s available at a very attractive price point, and it’s of high quality. First off, the hubs are sealed and spin really well. When it first arrives be sure to hold each wheel by the axle and spin it in your hands to test. It should be smooth and silky. The rims are twin-walled aluminum alloy, and they offer a sophisticated style with a deep dish rim depth of 40mm. They’re slick and stylish without being flashy or over-the-top. The sidewalls are machined, meaning you can use standard V-brakes without any issues. There are a healthy 32 spokes, making for a strong and durable wheel. Flip-Flop Hub: Yes, with a 16T fixed and a 16t free side. Tires & Tubes: No, but the rim does come pre-taped. Be sure to pick up a couple of tubes and tires between 23c and 32c. Overall, this is one of the top options for a cheap set of fixed gear wheels. They’re everything you could ask for on a limited budget, with very little compromise. If you’ve read my other articles, you’ll know I’m a pretty big fan of State Bicycle Co. They are almost exclusively dedicated to track and fixie stuff, and I find they’re a notch above industry average in quality. These attractive and affordable State 700c wheels roll really well on sealed Quando hubs. They’ve got 32 spokes per, which ensures enough strength and rigidity for a versatile ride. The rims are lightweight allow, and the sides are machined to facilitate brake pads. You’ll probably notice a more profound rim profile. 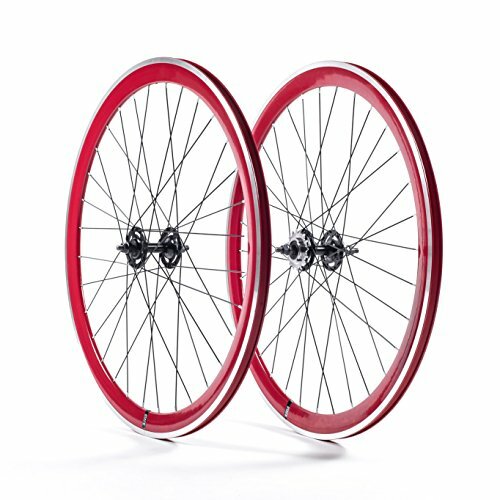 With 43mm depth, these deep-v fixie wheels will make any bike pop. You’ll have to decide for yourself if that suits your style. Hub Spacing & Configuration: 100mm front, 120mm on the rear. Bolt on. Flip-Flop Hub: Yes, but comes with only a fixed cog (16t). You’ll need to purchase a coaster cog separately. Tires & Tubes: None, but comes with rim tape installed. As cheap track wheels go, the State Bicycle Co. set is well worth considering. Retrospec is one of my favourite brands. They’re pretty much all about fixie stuff, so it comes as no surprise that one of their products hits this list. The budget-priced Mantra is a set of truly deep-V set of wheels. Their rim depth is actually 43mm, but the mono-colour look ensures that these guys look a heck of a lot deeper than they are. I think they’re gorgeous. The rim material is alloy, and they’re double-walled for strength. Because of the full colour metal, it’s hard to see that the rims are machined to accept calliper V-brakes. They’re reasonably light in weight too. The hubs feature the same colour as the rims, and the matching hues make any bike look like a million bucks, even if your frame is a beater. They are most certainly not “stealthy”, but where’s the fun in that? Hub Spacing & Configuration: 100mm front, 120mm on the rear. Bolt on axle. Flip-Flop Hub: Yes, and it includes a fixed cog, freewheel and lockring. Tires & Tubes: Yes, Kenda Kwest. The price tag is so inexpensive here, and yet the quality is apparent. They offer premium looks even a miser can afford. 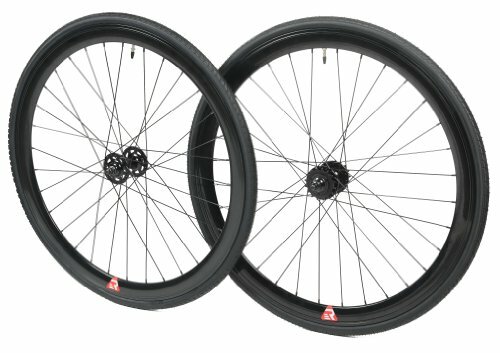 This is one of the best, affordable fixie wheelsets for well under $200, and I definitely recommend you check it out. You might recognize the name Vuelta. They’re a well known brand in the bicycle wheel industry, and they’re not just restricted to fixies. Vuelta has something for just about every riding style and budget. The famous Zerolite line has been adapted to fixed gear use, and it’s developed into a top-notch single speed wheel set with stealthy looks, excellent build quality, and heaps of positive reviews. The rims look professional, with a 30mm depth and aluminum construction. The looks are rather subdued. With those race-inspired rim stickers, they look more at home on a road bike than a hipster chariot. This was the first set of track / fixed wheels I owned, and I consider it one of the best options for a beginner builder. Because of the simple looks, they’ll match perfectly on anything from gorgeous track bike to a quirky urban warrior. And perhaps most importantly: these are the cheapest fixie wheels I’ve found, the best affordability-to-value that I’ve come across. Flip-Flop Hub: Yes, with 16t fixed cog and lock ring. No freewheel included. Tires & Tubes: None, but comes with urethane rim tape pre-installed. In addition to all the fine features listed above, the Vuelta Zerolite reviews really nicely, and they happen to be the least expensive fixed gear wheels in this list. Can’t I just get a single fixed gear rear wheel? To save money, you might consider just changing the rear wheel for your fixie conversion. This makes sense if, for example, you have a frame that’s already complete with 700c or 27 inch wheels. You save money. Two wheels is almost always more expensive than one. Less work overall. Less fitting, brake adjustment, etc. A fixed gear rear wheel can be swapped in pretty easily. A smaller front wheel is an advantage if you want to do tricks like bar spins, etc. You’ll have a frankenbike. If you’re very big into symmetry, this will bother you. The front and rear wheels not matching could be a dealbreaker. Older wheels might not be as strong. Sometimes it’s a good practice to upgrade everything, especially if there’s rust, or if the spokes aren’t in great shape. If you have any other questions or comments, feel free to leave a post in the space provided below. Thanks for reading and happy trails!